It was a huge night a champions league night and Real where in town. We had the crucial away goal going in to the tie but with the array of the Galácticos we knew we're in for a tough night. It was a damp and cold Wednesday night not so much raining but there hadn’t been enough sun in the day dry off the deluge we had the night previous. A night you could feel the cold in your bones. Most of the pre match hype was about golden balls first game back on English soil. We had a few injuries to the backline which wasn't the greatest seeing as we had to keep them out. And from the off it was electric, Real had the best of the early exchange and Tommy Gravesen picked out Ronaldo who's onside on the far post and Jens just manages to scrabble it round the post this was just in the third minute. 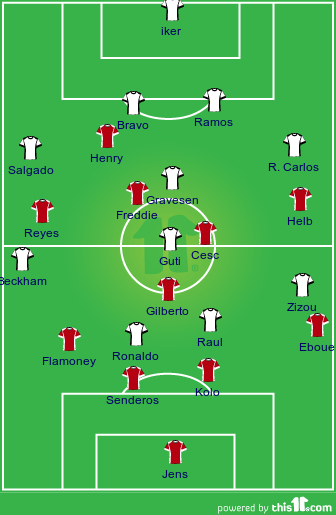 The pressure continued in the midfield Gravesen and Guti where nipping at the heels of a young Cesc and Gilberto. Zizou was impervious on the ball even at the age of Thirty three and was opening us up down the left time and time again finding Roberto Carlos many a times in the first half. Gilberto was all over Zidane, which also added to the tension, as giving away free kicks round the box is something you don’t want to do with Roberto Carlos and David Beckham on the pitch. When we could, we countered we looked dangerous but no final ball or real product (sounds familiar huh) late in the half Reyes hit the bar, it was laid off from henry and should have been over then. It was an absolutely enthralling game end to end we’d attack with amazing pace while the tried to cut us apart with tricks of Zizou and the power of Ronaldo. It went from not give pen to off the woodwork at the other end each set of fans not knowing if this could be the break through enslaved to the game as they were. The second half game really opened up and Raul had one off the bar and both teams where getting half chances but such was the defending from the full backs on the pitch no one was allowed in. Flamini was awesome on the night and Beckham never got the chance to cross the ball in from the right. Henry found more space after Gravesen went off and he managed to open up Real, so many times did we expect the net to bulge but it didn’t. Either Iker managed to tip it round the post or just a yard either side of the post. Real were mostly threatening form free kick usually won by Zizou and then becks would launch them in he almost scored one and a Ronaldo header which was went well over but at the time it was felt like just inches. The closing stages came each second took an eternity, finally the whilst was blown and we were on our way to the quarter finals Juventus. Gianni Brera once wrote ‘The prefect game would finish 0-0’ and Arsenal vs Real Madrid on the 8th March 2006 was perfection personified.